Wanted to snuggle up and luxuriate in some shade of red. Luckily, OPI Tease-y Does It wanted to snuggle up with me, and I couldn't resist it's wanton charms. OPI Tease-y Does It. Three coats. 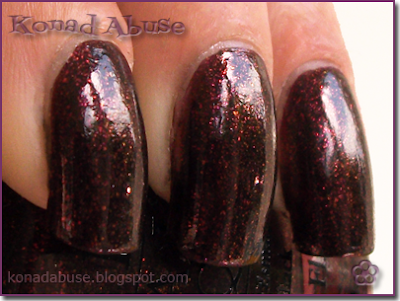 Tease-y Does It is a deep burgundy with a red shimmer that shifts to gold and green in the bottle, but not so much on the nails - you can just about make out the colour-shift in the photo. Application was no problem and it took three coats to get a good shiny finish. 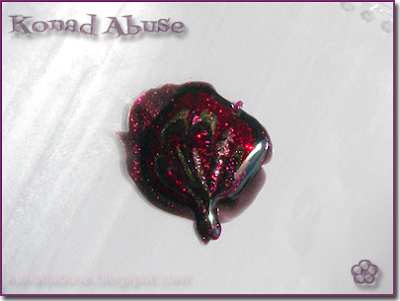 Not my usual sort of colour at all, but the red shimmer completely won me over and I, errr, like it. 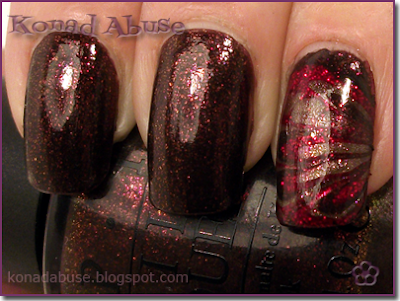 I can't water-marble, it gives me the right hump, but I wanted to try out some marbled nails with the Tease-y Does It, Urban Decay Twisted (gold) and China Glaze Ruby Pumps (red). The following method came about whilst practising for yet another water-marbling disaster, and I found it to be much easier and less messier than the water-marbling. Not only that but the polishes take a while to dry as well, giving you more time to work. Result! On the downside, it's very slow process as you have to let thick layers of polish dry, this is awful if you're an impatient soul like me. 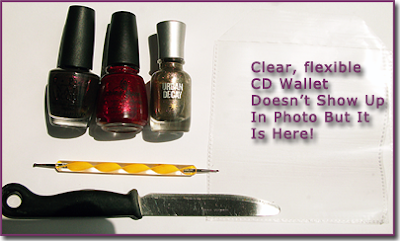 You will need some polishes, one of those floppy plastic CD containers, a marbling tool/toothpick/watchmaker's screwdriver/small pointy implement and a sharp scrapey thing, such as a razor, knife or Konad scraper. 1. 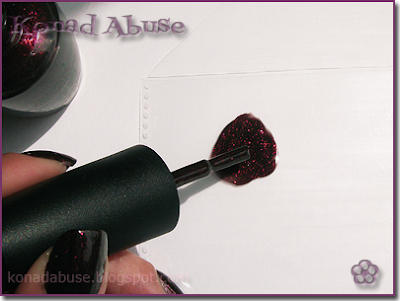 Draw a large circle with a fairly thick layer of your base colour polish. Try to size it so it fully covers your nail. It's my rarely seen thumb! 2. 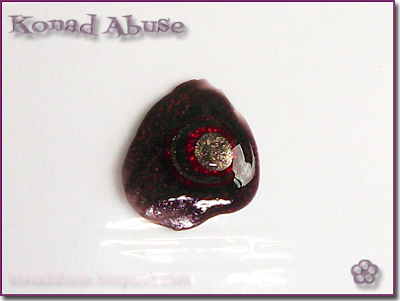 Drop a drop of your next polish in the centre of the still-wet polish. It spreads a bit further if you drop it from a bit of a height, and you can spread it a bit further by gently pushing it with the brush/marbling tool. Add another drop if it doesn't spread very far. 3. Same as above with your third polish. You see where I'm going with this, don't you. Drip the polish, make pattern. 4. Starting from the top, lightly drag your chosen marbling tool through the wet polishes. Looks like a <3, ahhh. Future Valentine's Day Manicure spotted. 5. Do some more straight lines. Or squiggles, whatever, this marbling is much more fun to experiment with. 6. Now it's time for the hardest part -- letting it dry. It takes ages. Leave it overnight if possible. 7. A few hours or so later, peel a bit using a razor-blade or a Konad scraper-me-do. It should peel off easily, if not leave to dry for a bit longer. Picking at it, finding it not dry, trying to leave it alone. This is hard. 8. Grab your peeled bit and gently peel it off the plastic with your fingers. Again, if it seems a bit tacky or sticks to the plastic, leave it for a bit longer. 9. 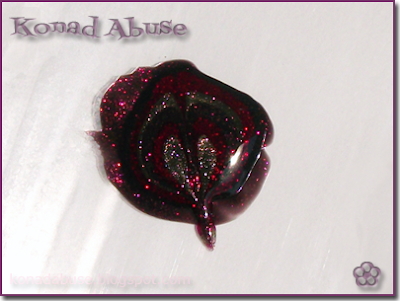 Put on a thin layer of top-coat/base colour. Apply the marbled polish on your nail, position it in a way that you like, and trim any excess off with some little scissors. Don't worry if you can't get all of it, that can be sorted with a brush and some nail polish remover. Oh, that looks so attractive. 10. Apply some top-coat. If you have any peely bits put some top-coat underneath and stick 'em down. 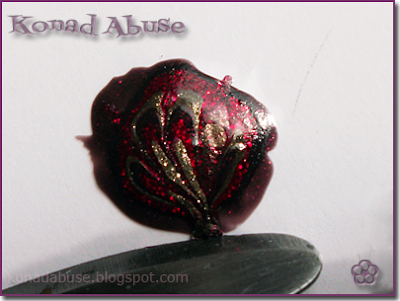 Removal can be a PITA, depending on the polishes, but the glitter removal trick works well here. And there we go, easy but slow marbling, and not a spot of Konad abuse in sight. Feels weird. This is awesome! I dread water marbling because it dries so fast. I'll have to try this! I haven't ever done "traditional" marbling,as it seems incredibly messy. I like your take on marbling,it's edgy looking! Ooh, I do like that. Very striking. Thanks muchly peeps :) Had some ideas on how to improve the process so am having another go at it tonight. In PASTELS. Oh that's gorgeous! Nice idea! 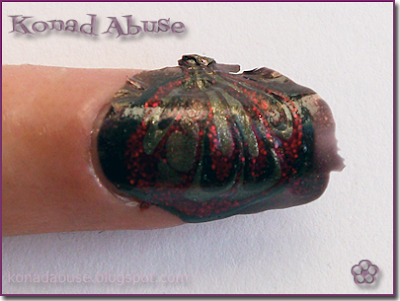 Lovely :) a great take on marbling, I'll have to try it out!